I was lucky enough to attend the Vogue School of Style last evening, hosted by Priyanka Khanna, Priyanka Kapadia and Parizaad Khan. The three ladies shared fashion and beauty dos and don’ts with plenty of examples, and some neat tips and tricks. While I took lots of notes, here are my top ten lessons from the workshop. Cost to Wear Ratio: Price of a piece divided by the number of times you wear it or are likely to wear it. Use this to know whether buying those hot pink pants will be a worthwhile purchase. Hero Piece: The great piece you love that should be the focus of your ensemble, like a necklace, big tote or printed blouse. The hero piece should ideally be a trendy one, and everything else should highlight that accessory or garment. CSR: Comfort, Style and Relevance. That’s the formula for putting together a work look. Asian influences: These could be prints or accessories like obi belts or simple touches like a Chinese collar or kimono tops. Green: It’s all about green this season. Pair light mint with a darker shade of mint, it will work! Safari: Wear linen, soft cotton and neutral separates with lots of pockets for a utilitarian look. Shop smart. Make at least three outfits in your head before you buy a piece. Have fun with staid corporate wear by playing with colours. Use pop shades and mix and match separates like pants, blouses and jackets, while keeping the look very formal. Give up black for the weekend. Wear prints to spread the cheer! A combination of matt and highlighted skin is in right now. So don’t powder all over your face, and let your natural glow shine through. Dior has made it to three fashion magazine covers this month- a good hit rate (and well-thought strategy). So you see Dior cover Vogue ( on Shweta Nanda), GQ (Ajay Devgn), and Marie Claire (Soha Ali Khan). I could imagine Shweta Nanda in Dior. Maybe even Soha Ali Khan (she’s got royal blood). But never Ajay Devgn- he’s too rugged, too massy and too unfashionable for high fashion, right? But Vijendra Bhardwaj, who’s styled Devgn on the cover and photo feature, has got the actor looking surprisingly at ease comfy in designer wear. Or maybe it was Devgn’s best-kept fashion secret or he’s a brilliant actor. Nevertheless, Vijendra’s done an excellent job in this shoot. Meanwhile, I am surprised with Vogue’s choice of cover girl- they had earlier made a shift from top models to Bollywood stars. Are they moving to the high-class social circuit now? It’s highly possible, given that Bollywood is quite devoid of classy and fashionable folks and that the Bollywood-loving audience may not be the ideal (or real) Vogue reader. Wait and watch! Roberto Cavalli for Sonam Kapoor– again! A couple years ago, Sonam Kapoor shot a spread for Vogue with Roberto Cavalli at his mansion in Italy, wearing only the designer’s creations. 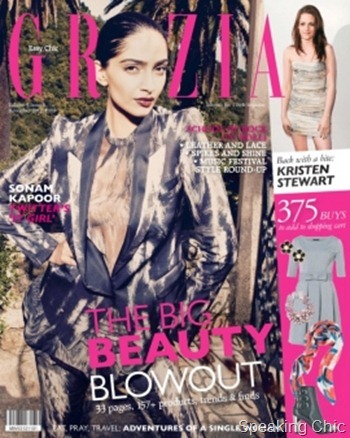 In November’s issue of Grazia, Sonam’s done a repeat (though not at the Cavalli mansion). Sonam dons Cavalli on the cover and in the photo feature. Too bad there’s no mention of any exclusive contract or deal. Women’s Health is not exactly a fashion magazine, but it’s certainly aspiring to be seen as a upscale one, with focus on intelligent content and an appealing layout. Diesel seems to be taking it seriously- since it’s everywhere in the magazine this month. Kalki Koechlin wears Diesel on the cover and the photo feature inside, the inside cover two-page ad is Diesel, and there’s a special photo feature dedicated to a jacket’s multi-tasking ability. That jacket is, of course, a Diesel. In my previous post, I introduced Cocktail fashion with help from the movie’s costume stylist Anaita Shroff Adajania. During my chat with her, I got deeper insight into the movie’s costumes- developing the looks, brands to spot, and key trends. Here are the highlights from our style chat. How did you relate the characters in Cocktail to their costumes and looks in the film? Each character in Cocktail is different from the other, so it was easy to relate Veronica, Meera and Gautam’s personalities with their looks. Veronica (Deepika Padukone) is very fashion forward, mixing high street fashion with designer wear. Meera, being a middle-class girl from Delhi, is more conservative in her dressing- so she will keep her arms and legs covered as much as possible. Gautam is a well-off young guy with a casual approach to life and fashion. (To read more about their looks, read An introduction to Cocktail style). The film has a very international look- featuring trends like nautical stripes, shorts and prints. How did you achieve that? I work with a great young team- especially Ayesha Dasgupta, who has also dressed the supporting cast. Besides that, I spent time looking at how people dressed across the word, observing people and street style and recording memories and nightmares! I sourced for the movie in London and had brainstorming sessions with the director and producer. We discussed who the characters were, where they came from, what they did… even if it wasn’t part of the movie. My intention was to get the costumes right for the film. What are the key fashion trends in Cocktail that fashion lovers and fans could try? The top trend is montone- wearing the same colour from head to toe. For instance, Deepika wears a green t-shirt and shorts with matching accessories in the movie. Also, there are new ways of layering to try out- like belts over cardigans and shirts. And then there’s the return to the classics, such trench coats, and pairing tees with shorts. Then there is mixing of high street and luxury, deconstructed (oversized) t-shirts rather than figure hugging, and stacked accessories for women. What are some of the fashion brands you have used to dress Deepika, Diana and Saif in Cocktail? I’ve done a lot of high street shopping for the movie, along with some luxury brands. You will see Topshop, French Connection, All Saints, River Island, Pull & Bear and Zara, among others. As for the high fashion brands, there’s a patent pink bag from Chanel, sunglasses from Dior (for Deepika and Saif), Burberry trench coat and bag (for Saif), and an Hermes scarf. Diana’s character carries a Tod’s bag, and Amrapali Jewels are very important to her character. Which are your favourite looks from the movie? My favourite is Deepika’s poster look- sequined skirt (All Saints), with t-shirt, Dior sunglasses and flat sandals with feather. Among Saif’s looks, I love the t-shirt-blazer-jeans combo and unusual colour combinations like mauve and grey. As for Diana, her pink salwar kameez is gorgeous- love it! What should a fashion lover look out for while watching the movie? The list is endless, but here goes anyway… The Burberry leather jacket, Pucci scarf that Deepika ties in her hair, Monet jewellery, and the Anya Hindmarch bag. The brands are a subtle mix just like the title of the movie. 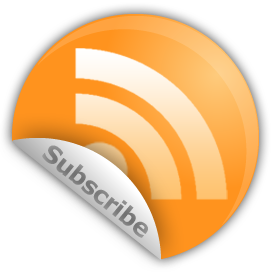 Reader question- How can I stay on top of fashion trends, yet look different from the rest? You must dress for yourself, and don’t copy movie star looks. You can individualise trends you like, such as layering. Choose a belt to layer over a cardigan, but it can be any cardigan, not necessarily the one you spotted in a movie or on a celeb. 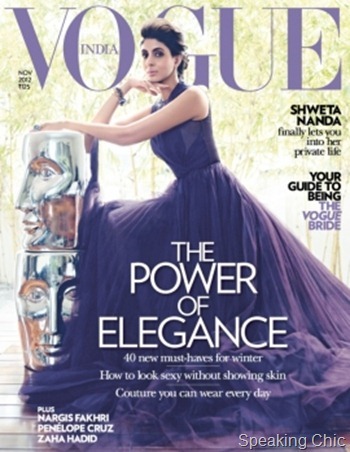 Reader question- You are fashion director at Vogue India, celeb and movie stylist and a mom of two kids. How do you manage to multi task so well? I don’t know the answer to that! I think good time management helps, stick to deadlines and have people respect your time as well. I think what makes it easy for me is that I love everything I do. Cocktail releases July 13, 2012. Talking fashion with Anaita Shroff Adajania is fun though a bit overwhelming. After all, she is fashion director for Vogue India and costume stylist for a bunch of movies, which kinda makes her an industry veteran. So of course I was nervous when I spoke to her about fashion in Cocktail, her latest movie project. With her insights, I’ve put together a primer on key looks in the movie. Enjoy! Veronica is a fashion forward gal, though she doesn’t follow trends blindly. She enjoys looking good and being the centre of attention, even though she makes her style look completely effortless. She experiments by mixing high street fashion with designer wear and dressing according to her mood. So you never know what she’s going to wear next! What she wears: Being a fun-loving girl in the movie, you will spot Deepika wearing off-shoulder tees, bold colours and prints, shorts, distressed jeans, designer bags and stacked accessories. Style in five words or less: Unpredictable, whimsical, fun! What I like: The animal print cardigan and gold party dress. Veronica’s fashion tip: Be your own person, folks! Pick up things you like- they could be from anywhere- and put your looks together. Meera is a middle-class girl from Delhi, hence her dressing style is a bit conservative- so you will see her in kurtas and patialas, and she probably still wears butterfly clips! She wants to blend in with the crowd, and will keep her arms and legs covered as much as possible. Even though she dresses for comfort, the layering makes her wardrobe exciting. What she wears: Meera’s staples are a simple cardigan with chinos or flared jeans. Her prints are simple too- nautical stripes, polka dots and delicate florals. Style in five words or less: Muted, feminine and understated. What I like: Layering cardigans over tees with skinny belts, comfy blouses and tees. Meera’s fashion tip: Simplicity is never boring. Being conservative can be cool! Gautam’s got a very casual approach to life and fashion. He wears a jacket to work only because he has to, and pairs it with a skinny tie. He probably doesn’t iron his clothes, and keeps it casual most times. He’s got the “lived-in” look. What he wears: Saif’s character enjoys wearing old t-shirts, easy shirts, shorts and subtly distressed jeans. Style in five words or less: Easy dressing! What I like: Worn-out tees and shorts. Gautam’s fashion tip: Wear your clothes with a bit of carelessness. Which character’s look would you like to try? 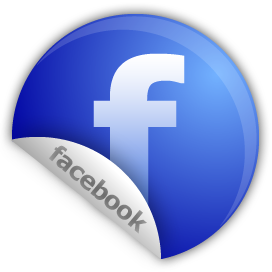 Lakmé Fashion Week Summer/Resort 2011 is coming up in March 2011, and the action is already heating up. From left to right: Reha Sukheja, Bryndis Helgadottir, Sophia Dgneid, Lekha Anantharaman, Angela Jonsson, Rikee Chaterjee, Keylie Bodeker. Almost 120 models turned up to audition, a whopping increase of more than 80% since the last season of LFW. 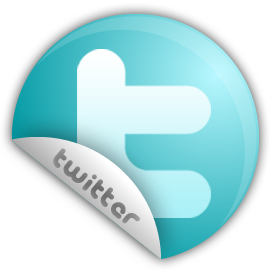 Good to know interest is increasing, but quantity doesn’t always mean quality. Fingers crossed on this one. Foreign models are coming to India in hordes! While the dusky beauties still dominate, are growing foreign imports a sign of things to come? Hmmm… hopefully the Balance of Fashion Payments remains tilted in India’s favour, eh? FYI, the model selection jury comprised well-known designers Nachiket Barve and Rocky S; fashion show directors Marc Robinson and Lubna Adams; photographer Jatin Kampani, Vogue India editor Priya Tanna, along with Anil Chopra (CEO – Lakmé Lever), and Sujal Shah (Vice-President & Head of Fashion for IMG India). What should I wear: sari or dress? Or both? Which sari would you tailor into another garment? Tell us! What you see inside are some stark images, some close to being very disturbing. 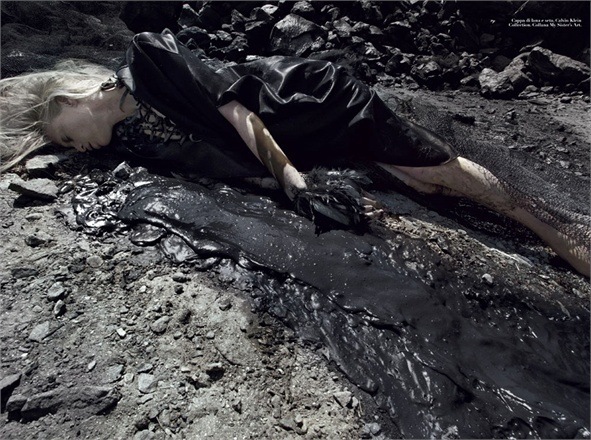 The photos (shot by Steven Meisel) project a poisonous atmosphere, and in one picture, model Kristen McMenamy is seen regurgitating contaminated water. Not for the faint-hearted. For those who still want to know about the fashion in the shoot, check out the Vogue Italia site or watch this behind-the-scenes video. Speaking Chic says: The next time someone says “fashion is frivolous”, please show them this photo feature. While these photographs will not reverse the damage caused, they make a poignant statement on the environmental and human impact of the spill. By showing a human in such a toxic setting, the magazine has brought to the fore what several upper-class people (Vogue readers) may have brushed under the carpet. We wonder what Tony Hayward would have to say about this one. 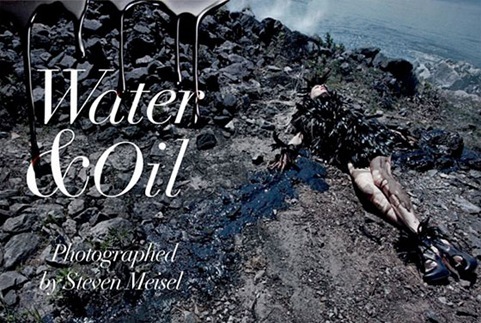 What do you think of Vogue Italia’s BP oil spill-inspired photo shoot? Tell us! That was someone’s reaction when she met me just after my week-long super awesome Rajasthan trip. And then, the tips started pouring out— besan, malai, turmeric and even tomatoes made it to the “Quick Ways to Get Fairer” list. It turns out we’re a nation still obsessed with fairness. And it’s not just with the fairness creams for both women and men (think John Abraham and Shahid Kapoor). It’s in the attitude. Yep, swimming often does darken your skin, and despite the copious amount of sunblock I applied, the tan came. But guess what? I love it and I grab every opportunity to show it off. So when I saw the April cover of Vogue India, hailing the country’s dusky women, I couldn’t but stop and think—this is just what we need. Some of the photos are gorgeous and they show India’s lovely “dark” skin like never before. It may be just another cover shoot for the magazine, though there’s obviously some thought gone into it. Could this be the step that can change the perception of Indians and the fashion industry? I certainly hope so. PS—I’m not the only one who’s loving it. Check out Vogue UK’s coverage of the path-breaking(?) cover and the Feminista’s perspective on the cover and the colour issue.